Though India braces for monsoon season every year, this year’s early downpour left tragedy in its wake. Ferocious rains and ensuing floods in mid-June left thousands dead throughout the northern state of Uttarakhand. Rishikesh, fondly known as the world capital of yoga, didn’t escape the tragedy. Homes, ashrams, cafes and shops along the shore of the Ganges were submerged with muddy water, wreaking destruction that may take years to repair. The 17-foot Siva statue that graced the banks of the Ganges River in front of Parmath Niketan Ashram was swept away, a testament to the extraordinary fury of the river. Nearly a month after the floods, Rishikesh is recovering. While there are not nearly as many tourists as usual, local shop owners and yoga studios that rely heavily on tourism for their livelihood are confident that business will pick up soon. The flooding didn’t stop New Yorker Truike Boekholt-Daly from coming to Rishikesh. Founder of the ‘Children of the Ganges’ afterschool program for Rishikesh’s needy children, Truike makes an annual pilgrimage to the town to spend time with the children and plan for the year ahead with the local teachers and director. "Unfortunately disasters happen, and this one affected the state where our school is located," said Truike, reflecting on the disaster from Rishikesh. "To go on and recover and heal, one can choose to see the beauty and new possibilities after the initial shock and feelings of despair." From tragedy,Truike was inspired to create. One early July morning, she collected driftwood along the shores on the Ganges, and then cleaned and sanded it down. 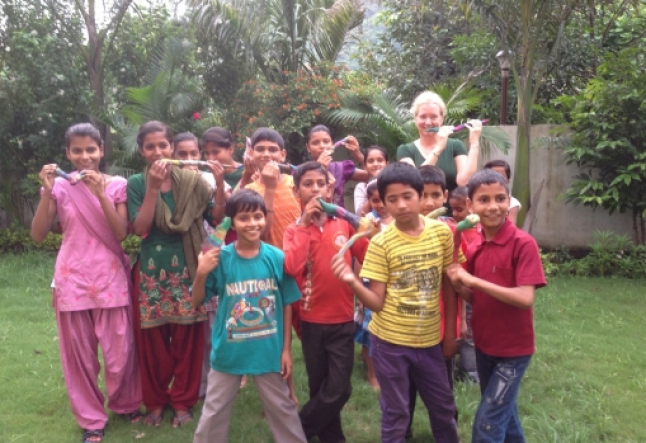 The next day, she gathered all 20 students from Children of the Ganges, spread out newspaper and watercolors, and let them get as creative as they wanted with the sticks. The students, ranging in age from 5 – 15, spent two hours painting the driftwood. The room was silent, and other than an occasional glance at their neighbors’ work, an intense air of concentration permeated the room. Truike is taking the sticks back to New York, and make them available to classroom teachers, yoga teachers, and anyone else interested in utilizing them for educational purposes. All proceeds from donations go directly to the school, which is sustained entirely through volunteer fundraising efforts. "We've turned the wooden branches left behind by the flood into marvelous pieces of art," said Truike. "These can be used as 'talking sticks' in classrooms or for theraputic group sessions," she suggests. A classroom teacher herself, Truike explained that the person holding the stick may talk or share while others in the classroom listen. "These are great for younger students as a tactile remind of who should have the attention of the group at the moment," she said.